I've had this Jamie Oliver recipe in the back of my mind for months. Well, flurries started falling this week, so I figured it was the perfect time for this warm, hearty meal. This is really a meal for a Sunday... it's simple and easy but not fast. Be prepared for your house to smell like ham... I think ham stock is my new favorite thing. I want to cook everything in it. Jamie Didn't have garlic in his recipe, but you know me. I decided to use this opportunity to try out this cool garlic peeling trick. You just put a whole head of garlic (or 2 or 3!) in a metal bowl, then put another metal bowl, the same size on top to make a big ball. 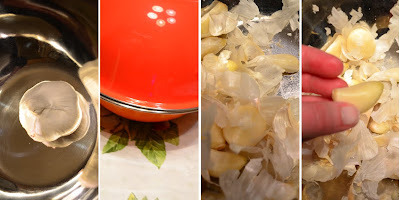 Holding both bowls together you shake shake shake the garlic for like 20 seconds, and when you're done, all the garlic cloves have escaped from their peels! It's amazing! And fun! LOUD NOISES!! Put the ham, peppercorns and bay leaves into a stock pot, cover with water and bring to a boil. reduce the heat and let barely simmer for at least 1 and a half hours. Add the carrots, fennel, shallots, garlic, celery, potatoes and turnips to the pot, season and bring back to the boil. Simmer for about 45 minutes until cooked. Remove the ham and vegetables from the pot using a long pair of tongs or a slotted spoon and set aside. Add the kale to the stock and bring to a boil. Cook for 5 minutes until tender. Check the seasoning of the boiling stock, then remove the kale and add it to the rest of the vegetables. Pull the meat apart using two forks. Place vegetables and ham in a bowl, and ladle a good amount of the broth over them. Sprinkle with fennel fronds and olive oil. Serve with mustard and pumpernickel bread. While I waited for the Ham Stock to cook, I made this sparkly cocktail that has some of the flavors of the season. Yum! Fill a glass with ice, add 1 oz. Pernod (anise-flavored liqueur) 1 oz. gin, ginger ale, a squeeze of lemon and a slice of ginger. It's like an Italian Christmas cookie in a glass! Great photos, Stef ... you are getting really good!